We are Open Garden Square Weekend and we celebrate London’s little-known green spaces. For one weekend every June around 200 gardens are opened up to the public. Palaces, prestigious garden squares, roof and community gardens - all take part. We’re based at Duck Island Cottage – in St James’s Park, so we are really at the heart of things! Our blog will explore a unique garden every month, leading up to the June event, hopefully giving you ideas and inspiration. 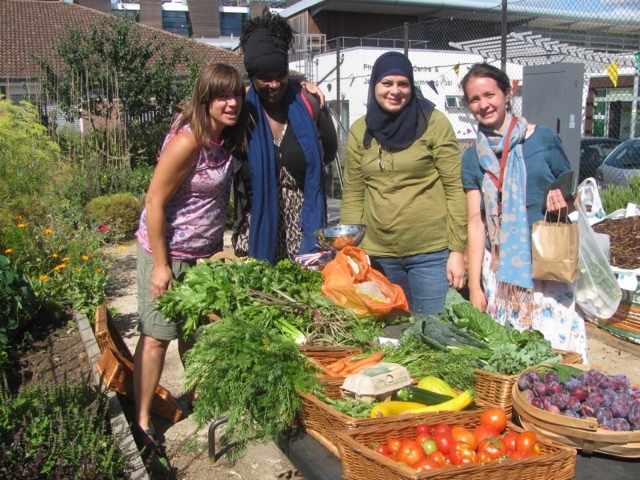 On the White City Estate growing vegetables and herbs involves all parts of the community - residents, school children, and restaurants. And maybe it's that link with restaurants that has so successfully extended learning from just growing to cooking and preserving the fruits of the land. 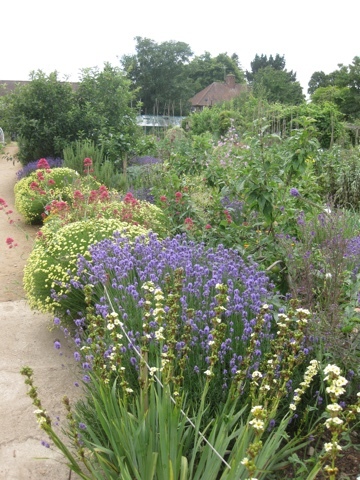 And they do it all so beautifully too at Phoenix School Farm and Learning Zone, with flowers like these Sisyrinchiums adorning pathways across this diverse and impressive space. An inner-city acre of special horticultural interest, which has won almost every gardening award in the book. 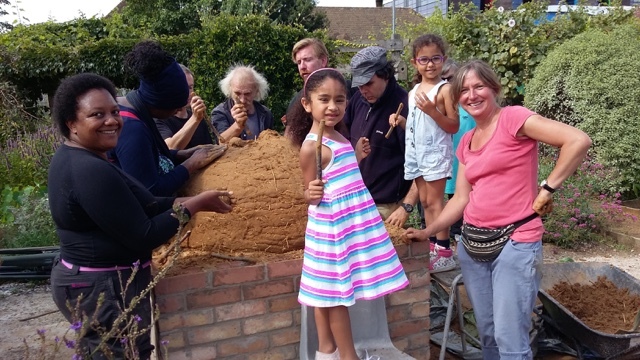 Owned by Phoenix High School and run in association with Hammersmith Community Gardens Association, the farm won the Green Flag Award for 2015-16 and was declared to be outstanding by the RHS Britain in Bloom award in 2015. 2015 also saw the garden open for the first time for Open Garden Squares Weekend. 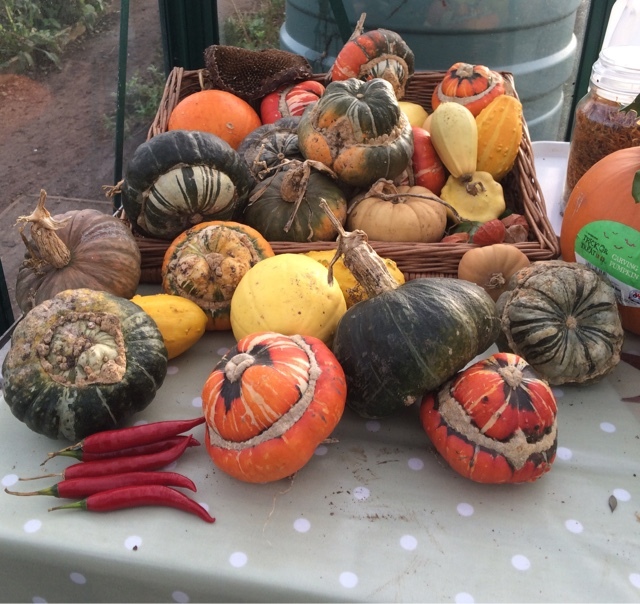 National Lottery funding for a community nutritionist has been used very imaginatively for a range of organic food promotions. A pop-up farm produce stall, as seen here, is now a much used community resource and focus for the garden. 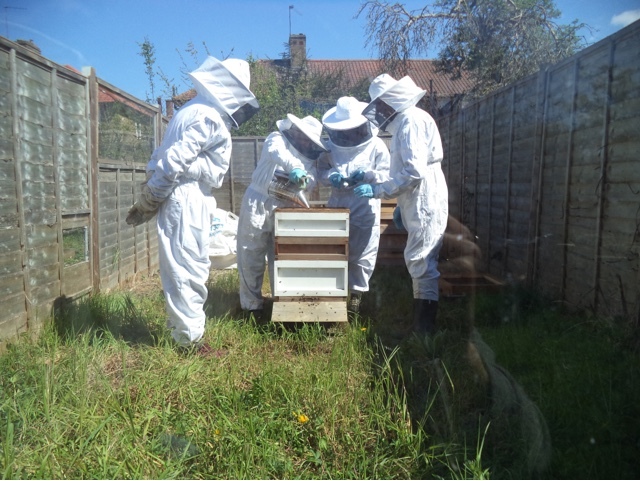 Volunteers do everything to keep the garden running, including looking after the beehive and harvesting the honey. 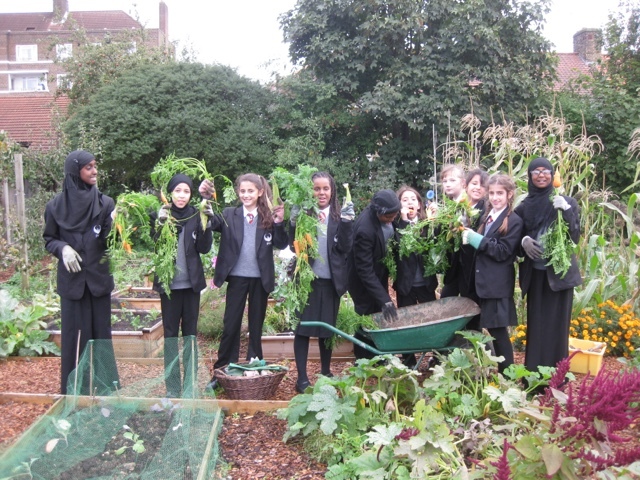 The school uses the garden all year round as an outdoor resource for all subjects in the curriculum. There are regular growing sessions and healthy eating events at lunch time, after school and in the summer holidays. The children also look after the animals, which comprise seven chickens, two rabbits and five guinea pigs - and I watched as the chickens pecked at and gobbled up heritage rainbow corn seeds, red and pink and black. 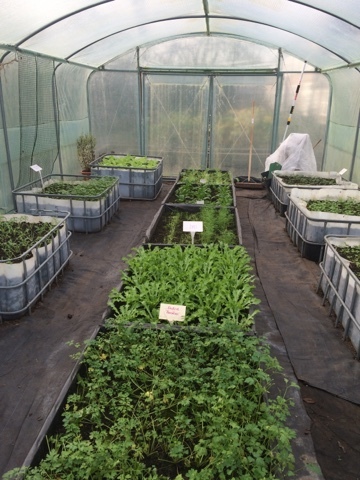 There are three polytunnels and two greenhouses, one of which is also used for a meeting/gathering space. 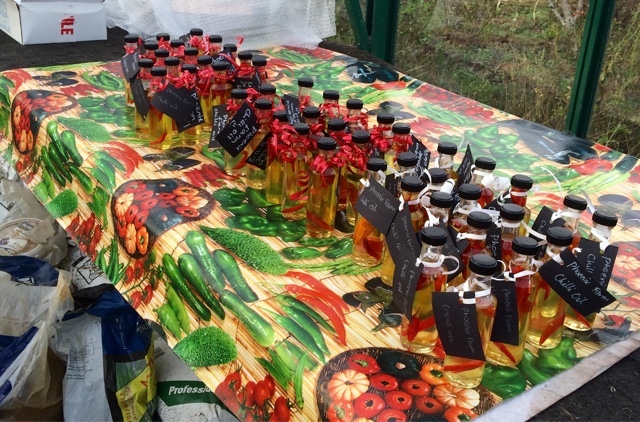 School sixth-formers had been preparing for a lunch for local pensioners when I visited and bottles of chili oil were cheerily lined up ready for giving away - and they were awash with seed bombs of annuals such as sunflowers, calendula and nigella, all wrapped in clay and compost and labelled, ready to throw. Taylor Woodrow workers often surface from tunnelling Crossrail to help the farm school. This oven is their latest project. They built the brick plinth and it is now awaiting a roof to complete the structure. Made of sand, clay and straw, local people helped trample down the mud concoction for the oven with their bare feet. With a bit of luck and some fair weather, you may be able to sample some baking from it at the next Open Garden Squares Weekend. There's always plenty for Taylor Woodrow to do - the latest inclusion on their list is repairing the grape arbour in the central seating area of the Learning Zone. Luckily the grapes had been harvested before the storm and next year the garden hopes to taste the wine from its first vintage. Cath Knight is the garden's Community Food Grower. When I met her, she was busy shelling pea beans - an old fashioned cross of peas and beans. She comes up with ideas for inspirational projects and is changing the eating habits of local people - one family is now switched on to the peppery delights of nasturtiums, and others now know from direct experience how good home-grown produce can be. 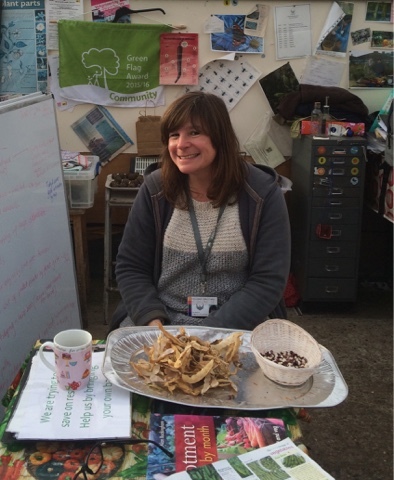 Bringing communities together through growing and cooking is led by Cath with great panache. 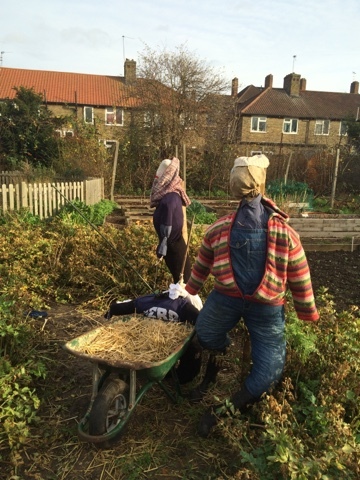 Even as winter approached there was lots growing on the farm for the scarecrows to patrol. An ancient heritage barley was pushing forth its green shoots for next year's bread, and there were still curly kale and leeks to pick and savour. Blueberries were hunkering down for winter surrounded by heather. It's easy to see why this garden is loved so much by local people.